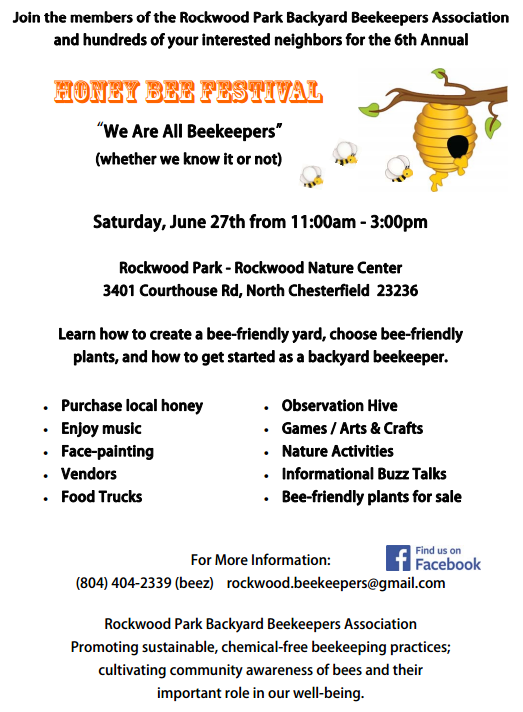 Just an early reminder that we will be having our Annual Honey Bee Festival on June 27th from 11am – 3pm. Attached are 2 flyers about our event – one to print and post, the other that can be printed, cut in half and handed out as flyers – we appreciate any can help with promoting our event! Post to your facebook page, email friends, post on your community bulletin board at work, etc. If you would like to volunteer to help with the event, please reply to this email and the appropriate committee member will be in contact with you. Author ...Posted on April 14, 2015 January 5, 2016 Categories Community Events, Honey Bee Festivals, Just for Fun! Previous Previous post: Honey Bee Festival! Next Next post: Special Opportunity and Meeting Announcement.